In the market for a new freezer? If you’re feeling overwhelmed by all the new freezer options out there, you’re not alone. Choosing the best freezer for your needs can be a challenge -- and we’re here to help. Why Buy a New Freezer? How will the freezer get used? Where will you put your new freezer? Do you mind manually defrosting? Which New Freezer Is Right for You? Refrigerators and freezers first changed the American way of life in the 1930s. Since then, owning a way to keep food cold has become a necessity. The chances are good that your new freezer won’t be your first one. But you still want to know you’re making the best choice for your family’s needs. What should you look for in a new freezer, and what are the best models on the market today? With the right information, choosing the right freezer for your individual needs is a breeze. Maybe you’ve been working with the traditional fridge-and-freezer combo for years. Or maybe your old, worn-out freezer still seems to have a bit of life in it. Is a new freezer really worth it? The experts say yes. Let’s take a look at the ways a new standalone freezer can benefit you. If eating healthy and saving money were both on your list of long-forgotten New Year’s resolutions, a new freezer is the answer you've been looking for. Food keeps far longer in a freezer than a fridge. In fact, food can be stored in a freezer indefinitely, as long as the freezer is working well and cold enough. If you buy a standalone freezer, it’s easier to keep food at the right temps so it won’t get freezer-burned. You’ll also be able to fit more into your freezer, which means you can take advantage of sales and bulk food deals. You can bargain shop, knowing the food won’t go bad before you can use it. This makes a huge difference in your monthly food budget. In addition to shopping in bulk, you’ll also be able to cook in bulk, since you'll have a place to store what you make. Excess leftovers are no longer a hassle when you have a freezer. Fresh produce goes bad fast. Whether you have your own garden, shop at the farmer’s market, or just take advantage of your local store’s produce section, it’s hard to buy produce in the right quantities. However, a freezer lets you store in-season bounty for later use. You can buy fresh produce, freeze it, and enjoy the like-fresh taste later on when it's well out of season. This also makes it easy to eat healthy, since you can always keep produce on hand. There are many nights when you’re too tired to cook and tempted to order takeout. But with freezer meals, you have fast, easy food that’s good for you at your fingertips. All you need to do is cook a large quantity of simple food, like chili or lasagna, and divide it into portion sizes before freezing it. This makes meal prepping easier, reducing the amount of money you spend on meals outside the house and keeping your healthy eating choices on track. It’s easy to see how a freezer will benefit you, no matter how big your family is. Whether you’re cooking for one person or ten, a freezer makes life easier. Asking the right questions can help you choose the best new freezer for your needs. Here are the things to keep in mind while you decide. An upright freezer is a good supplement to a small freezer compartment in the fridge since you can easily see what’s in it. But if you want to buy large quantities in bulk and keep them fresh all year, you’ll want a bigger chest freezer instead. You should also think about the features that you’ll get the most use out of. Safety locks are great if you have small kids who shouldn’t be getting into the freezer. Quick-freeze features are ideal for locking in the taste of fresh produce, while a soft-freeze zone keeps ice cream at the perfect consistency. You’ll find standalone freezers in four sizes: compact, small, midsize, and large. Small freezers typically have about five cubic feet, while large ones can have twenty or more. Larger freezers cost more in terms of energy use, so you don’t want a freezer that’s bigger than you need. The space you have, as well as the space you need, will dictate the size of freezer you can get. Measure the place where your freezer will go to see how much room you’re working with. Make sure there are a few free inches around it so air can properly circulate, and don’t forget to leave room for the door to open. Double check the path to get the freezer to its final location, too. Are the hallways and doors big enough for it to fit? If not, you might need to opt for a smaller size. If you’ll be keeping the freezer in a space without heat, like your garage, make sure it's designed to handle temperature fluctuations. Most freezers are designed to work in temperatures that don’t go below freezing. Manual-defrost freezers are quieter than auto-defrost models, which is great if you’ll be keeping it inside the house. Manual freezers don’t dry out food as fast, and they use less energy. However, if you don’t defrost them regularly enough, they lose their efficiency. If you don’t love the idea of defrosting your freezer by hand twice a year, an auto-defrost freezer is the better choice. There are a few things that set some freezers apart from others. Here’s what to look for as you choose your new freezer. Some features are more useful than others. The most popular freezer features include interior lights, power-on indicators, door locks, and an alarm for when the temperature inside gets too high. You’ll get more use out of your freezer if it’s easy to keep organized. Look for adjustable shelves for upright models or hanging baskets for chest freezers to help you maximize the space. A consistent temperature ensures your food will stay fresh, no matter what the temperature is outside the freezer. Quiet operation is especially important if you’ll be keeping the freezer near living spaces like the dining room or kitchen. If you buy a manual-defrost freezer, check that there’s a drainage port or hose that makes it easy to get the melted ice out. The best new freezers are highly rated for reliability. You want a durable model that can keep food frozen for at least 24 hours if the power goes out. Minimal energy use is important -- you'll save money and save the environment. The best freezers have been tested and highly rated for energy efficiency. Buy from a reputable brand, so you’ll have great customer service if your freezer stops working. This makes the process of repairing or replacing it much less stressful. With these features in mind, we’ve put together a list of the year’s best freezers. Here’s how we picked them, and the models that came out on top. Customer reviews are among our most important considerations for the best freezers. If they don’t stand up to the test of real-world use, they don’t make the cut. Our favorite freezers are highly rated and have some or all of the features listed above that make them easy to use. 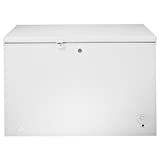 If you want a good amount of space without going overboard, this chest freezer is a perfect choice, at $650 to $700. This model comes with included storage bins so it’s easy to keep things organized. The key lock keeps your food safe, and the high-tech foam insulation makes this more efficient than many of its competitors. The features make it even easier to use. There are interior lights, a simple temperature control knob, and a hose adaptor for when you need to defrost. The round corners are easy to clean. Some users have noted that the storage baskets sometimes fall down. This model has not been reviewed on Amazon, so it does not have a rating at this time. Take things up a notch with the same reliable Whirlpool model in a larger size, which runs for a relatively affordable $1,000 to $1,500. This large model has the same features as the 15-foot Whirlpool freezer listed above, plus lots more space. Reviewers agree that this freezer is big enough to store everything you need and then some, but they warn that you’ll need a lot of space since this model is so big. It has not yet been rated on Amazon, but it is a reliable choice for major storage needs. If you don’t need quite so much space or need to save money, this GE freezer is a great midsize option that costs $550 to $600. The reviews of this model are stellar. With more than 10 cubic feet of storage space, there’s plenty of room for most families to stock up on frozen food. The Energy Star certification ensures you’ll save money on your power bills, too. It includes easy-to-use temperature controls, interior lights, and three organizational baskets. You can lock it when you need to, and check the power indicator to be sure that it’s working properly. Reviewers agree that the temperature is easy to set and that it’s a quiet, efficient model. The one-year warranty helps protect you if anything goes wrong, however, it has does not yet have an Amazon rating. If the idea of having to dig through a chest freezer exhausts you, this upright freezer is your best bet, at $500 to $550. This freezer offers all the space of a chest model with none of the hassle or space constraints. Bright lights illuminate the huge amount of storage space inside. The racks, shelves, and other removable storage features make it easy to keep organized, no matter how full you pack it. The sleek white surface is resistant to smudges and fingerprints, and this freezer’s thick walls keep food cold even if the power goes out. It has all the features reviewers love, even a security lock, earning it a 5 out of 5 stars rating on Amazon. If you don’t want to break the bank, Haier’s small chest freezer costs just $200 to $225. Five cubic feet may not sound like a lot of space, but it will still greatly extend how much food you can store -- up to 175 pounds can fit inside! Since this freezer is flat, it’s easy to push up against a wall, making this a great choice if you have limited space. The removable basket lets you keep your favorite foods handy, and the defrost drain assists with manual defrost. Although some reviewers say there aren’t enough storage bins, it’s easy and inexpensive to buy a few more. Reviewers have also noted that this model is super quiet, giving it 4.4 out of 5 stars on Amazon. Looking to save on an upright model instead? 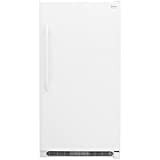 Try this small freezer from Midea for $200 to $250. This freezer is about the same size as the fridge you’d find in a dorm room, so it’s a great space-saver. A wire basket and two shelves ensure you can organize the three cubic feet of storage space. It’s incredibly quiet, as well as compact. Since the door is reversible, it’s easy to make this freezer fit into tight spaces. Choose from three finishes to match your decor. Although it’s small, this Midea model has 4.2 out of 5 stars on Amazon. There’s small, and then there’s compact. If you’re looking for the latter, you can’t go wrong with Whynter’s mini freezer. Looking for a freezer that will fit in an office, dorm room, RV, or other small space? This efficient little model will do the trick. It’s Energy Star-rated so it won’t eat up power while keeping your frozen items handy. Use the temperature dial to adjust the settings, and use the wire shelves to organize your favorite foods. You can reverse the door on this model, too. And it locks, making this a great choice for spaces that aren’t totally private. The one-year warranty will keep you covered if something goes wrong, but the 4.1 out of 5 stars rating on Amazon suggests that this model is quite reliable. It’s small but it’s fancy: this Summit model meets your high-end needs for $900 to $1,000. This 3.5 cubic foot, two-drawer freezer can work as a standalone model or fit conveniently under your counter. It’s super easy to get food into and out of, so don’t worry about having to bend down to get inside it. The fan-assisted cooling keeps temperatures even, and the basket and dividers help you stay organized. Since it’s auto-defrosting, maintenance is a breeze. Reviewers rave about this luxe option, proving that you get what you pay for. This freezer does not yet have an Amazon rating. Choosing the best new freezer is all about knowing what you really need. Consider the space you have, the features you love, and the budget you’re working with. We’ve included something for everyone here, so you’re sure to find the right freezer on this list, no matter what you have in mind. Investing in a standalone freezer saves you time and money, and even helps you stay on track with a healthy diet. Are you looking forward to enjoying these benefits with your new freezer? Let us know in the comments!